Weather and When to visit Cambodia? 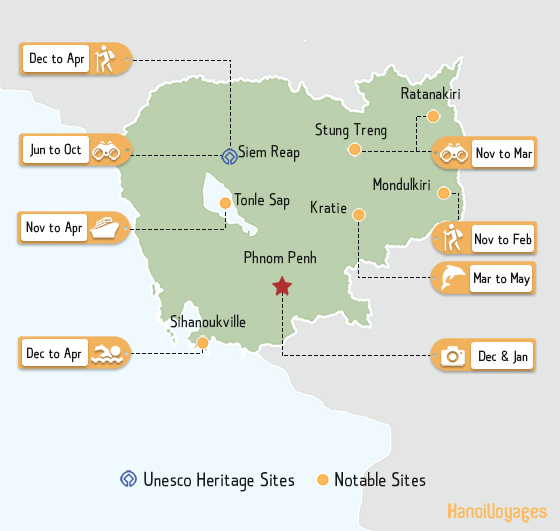 Hanoi Voyages > Cambodia travel guide > Weather and When to visit Cambodia? Cambodia, being blessed with warm year-round temperature, is on the list of for travel destination in any time of the year. Since the climate is advantageous, we do want to recommend the time that is less popular with tourists, and at a cheaper price as well! November to March is peak season in Cambodia (since the climate is dry and hot). 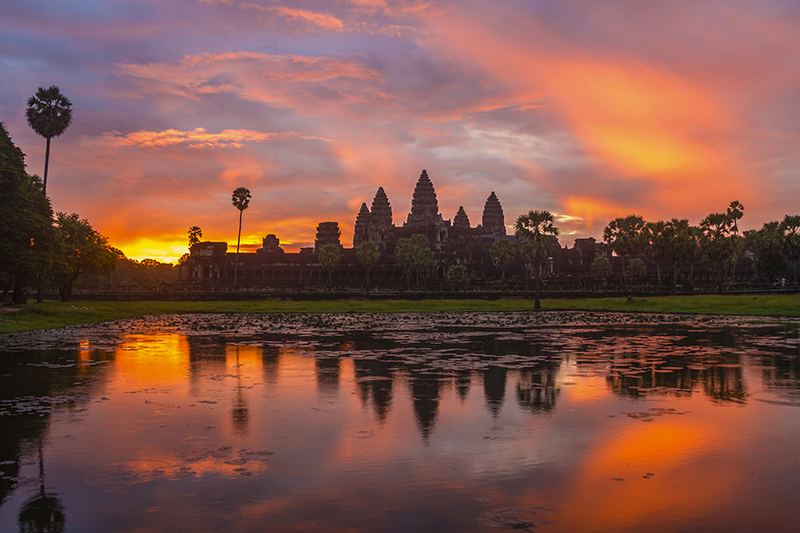 The best time to visit Cambodia is from May to early October (the wet season). If you are after landscapes, December and January are your best time to visit Cambodia as those months are the coolest. Our travelers’ biggest concern is the Cambodia rainy season. However the wet season should not bother you at all as the rain would end fast with bright sunshine. Surprisingly, this time of year is the green season when rice paddies and deltas spring to life. This season coincides with Cambodia’s peak tourist season because of the sun and the relatively cooler months (November to January). While November and January are cooler, by April, the weather is getting dry and is characterized by dust and heat. While most of the activities are available during this period, the coast is totally different from the rest of the year. Therefore, if you are a beach person, the dry season is the best time for you to enjoy the beaches and their calm water, like in Kep, Sihanoukville and Ko Kong. The dry season is also the best season to appreciate the clearest sunset in the Angkor site. 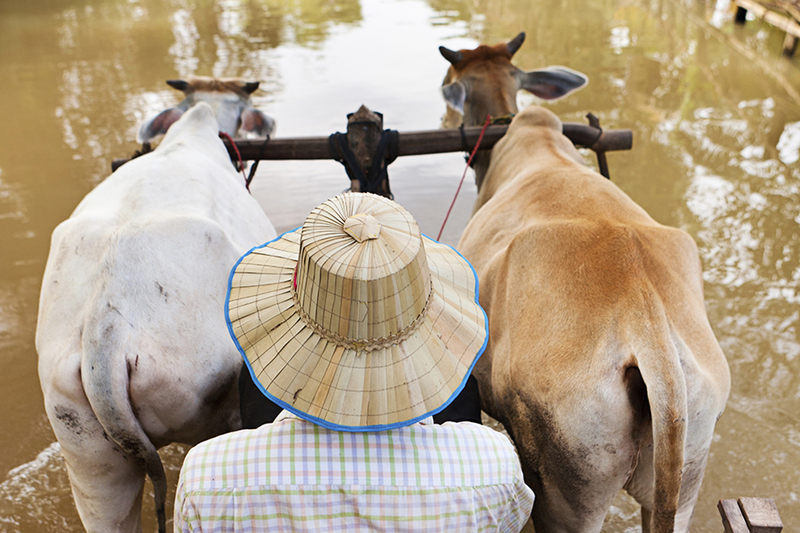 The Cambodian monsoon seasons should not put you off visiting. Why? Because the rain last only a few hours, and this is the best time to visit. In opposition to the dry season, the wet season is the season where you will find the fewer tourists visiting the country, and the prices are also lower than during the dry season. But what are the best activities during this period? You will be able to enjoy Angkor Wat with less crowd than during the peak season, making the experience more comfortable. The rain will also bring a totally different vibe to the site as the monuments are part the green vegetation. Witness a tropical storm for the first time and be amazed by the show you will get from the bolts of lightning piercing the sky, just watch nature perform before your eyes. 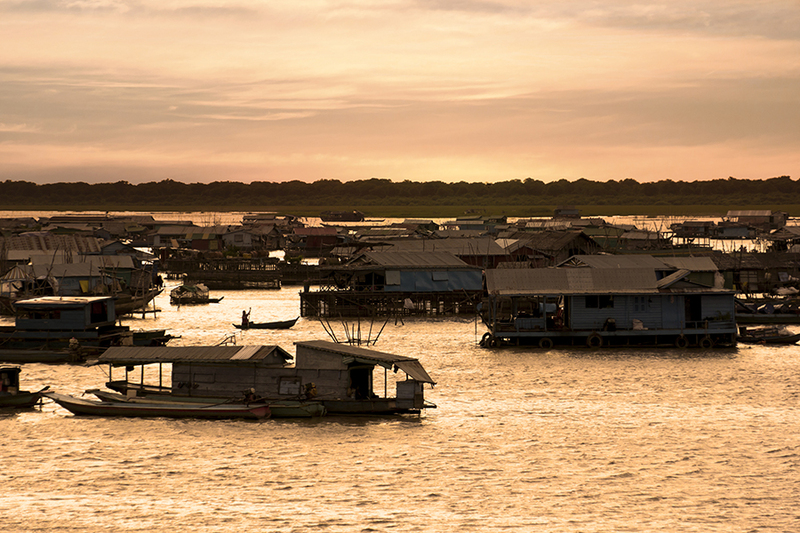 Monsoon season is the best period to visit the floating villages in Siem Reap. 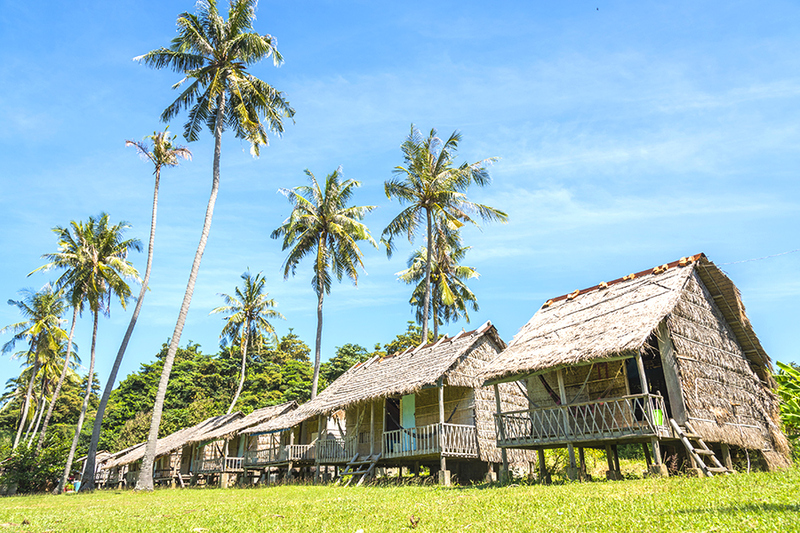 Venture through the stilt houses and discover the daily life of those people depending on the water and the unexpected weather.